After the first weekend of the national indoor league both our teams have all to play for this coming weekend when they fight to avoid the two relegation places from their respective Division One. At the UWE in Bristol the Ladies’ 1sts finished the first of their two weekends with four points from their four games to sit in sixth place with three teams below them while at Nottingham Trent University the Men’s 1sts finished with three points from their four games to sit in eighth place. The Ladies will have been disappointed not to have gained more than one point from their games on Saturday going down 5-2 (Sarah Brook 2) to Chelmsford and drawing 4-4 (Sarah 2, Annie Nunn, Lauren Rowe) with Ipswich before on Sunday gaining a splendid 6-3 win (Anna Tighe 2, Sarah, Maria Andrews 2, Lauren R) over Brooklands Poynton. They then lost 5-3 (Lauren R, Maria, Sarah) to league leaders Clifton Robinsons for whom out-on-loan Magpies Hannah Coulson and Jess Bloom were playing. This coming weekend Magpies play Bristol Firebrands and St Albans on Saturday and Leicester and Surbiton on Sunday looking for a couple of wins to retain their Division One status for next season. The Men got off to a bad start losing 11-3 (Ben Wright 3) against West Herts on Saturday before they had a superb 7-5 win (Ben 2, Thomas Ridley 2, Tom Hughes, Chris Barber 2) over Southgate. The scores were level at 4-4 after 32 minutes before Magpies pulled away with three goals in five minutes. On Sunday they went down 4-3 (Chris 2, Thomas) to St Albans after twice being in the lead before St Albans hit back with three goals. Magpies then reduced the arrears but were unable to find another goal against their East Premier ‘A’ rivals. In their last match they were up against a star-studded Holcombe team going down 12-1 (Ben). This all leaves Magpies with the demanding task of needing the minimum of two wins from their four games this weekend. On Saturday they play Cannock and Sheffield Hallam while on Sunday they take on Brooklands MU and Beeston. Tickets £12.50 (from Jackie Ridley 01379 854697 or 07815 199803 or the clubhouse bar) to include the tasting of 8 wines – plus cheese and biscuits. The wine tasting challenge to be run by a wine expert from Adnams with teams (organised on the night) competing against each other. PLEASE COME! Meanwhile at an overcast Weybread we had four Norfolk league games to watch before the East leagues resume this coming Saturday after the Christmas/New Year break. Three of the games were against Norwich Dragons and they didn’t go well for Magpies with defeats for the Ladies’ 4ths, 5ths and 6ths to get the club’s second half of the outdoor season off to a disappointing start. All three games followed a similar pattern with the Magpies’ teams having plenty of possession without creating gilt-edged chances while the Dragons’ teams were clinical in front of goal. 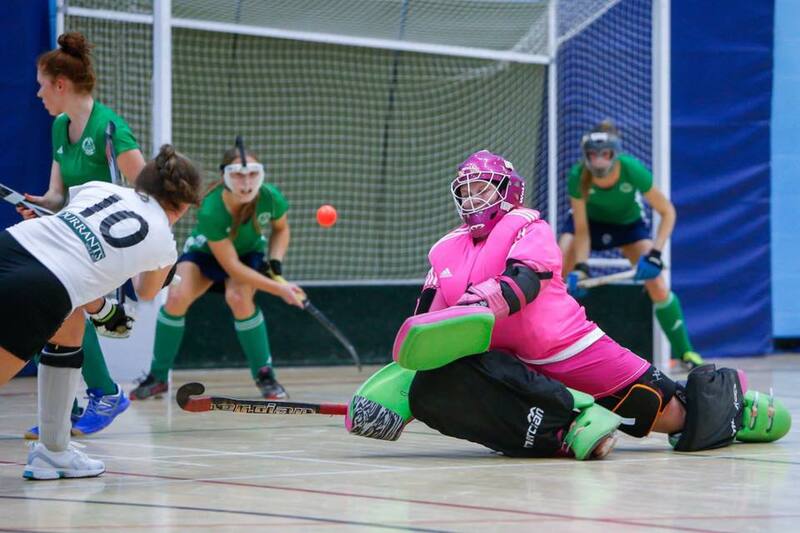 The Ladies’ 4ths started well against Dragons 3rds, who had ex-Magpies’ club captain Kristina Smyth in goal, and a win looked a distinct possibility in the early stages but they were unable to put away several penalty corners. In contrast Dragons converted their first chance before going on to complete a comfortable 4-0 win. This Saturday Magpies are away to Norwich Dragons 4ths (10.30). The Ladies’ 5ths conceded a first half goal against Dragons 5ths before Janna Freeman made it 1-1 at half time with her ninth goal of the season. After the break Dragons went into a 3-1 lead before in the last few minutes Amy Collison rounded-off an impressive personal performance when she converted in a goalmouth scramble. The final whistle came with the team looking for the equaliser. Hopefully they will be return from Pelicans 2nds (1.45) this Saturday with the three points. The Ladies’ 6ths were next into action against Dragons 6ths and they included four members making their debuts in ladies hockey after reaching the age of 13 in December. They were Ellen Pope, Holly Hanrahan, Honey Lamdin and Victoria Spouncer and all did well against a strong Dragons team who scored early in the first half. Magpies responded having a considerable amount of play in the Dragon’s half but they found the visitors’ goalkeeper in good form while at the other end Imogen Flatt was having a splendid game in goal for Magpies. Dragons eventually went on to win 3-0. Players of the Match for Magpies, who are at home to Pelicans 3rds this Saturday (1.45), were Verity Tomson and Ellen Pope. One can normally rely on the Girls’ Development, under player-manager Sandra Elliner, for a win and last Saturday was no exception despite the team going a rare goal down (only their third conceded all season) to Yarmouth. After their slow start Magpies, who were all aged between 9 and 12, came into the game and Jessica Tarrant equalised in open play before half time. Their deserved winner came when Jessica crossed from the right and the ball was deflected into the goal off two defenders. Magpies continue to lead their league three points ahead of Norwich City and this Saturday they are away to Watton (10.00). AUCTION OF PROMISES Saturday 4 March 2017. Please put the date in your diary and please excuse me going on about this event! We have now gratefully received 28 ‘Promises’. The target is a minimum of 50 so we still have some way to go to achieve this number. Please see the club’s website for more information and for full details of the event including how to offer ‘Promises’ or items for auction. The resumption of the East leagues feature some vital games for Magpies with none more important than those involving our 2nd teams. The Ladies’ 2nds have their longest trip of the season when they travel to Lincoln to play Lindum and they will be looking to get back to winning ways in pursuit of promotion after their 2-0 defeat at the hands of Dereham before Christmas. They drew 1-1 with Lindum early in the season before embarking on their fine run with 22 points from their next eight games. Meanwhile the Men’s 2nds, who are battling to avoid relegation, will be encouraged by their 4-1 win over Blueharts 2nds as they entertain joint league leaders Shefford & Sandy (2.00) who have done extremely well following their promotion. When the teams met earlier in the season the Bedfordshire side won 5-3 but with a little luck Magpies could have come away with at least a point. The Ladies’ 3rds, who have taken nineteen points from their last eight games, host Dereham 2nds (12.00) who are just one point behind them in 6th place and both teams are still in with a chance of promotion. The Men’s 3rds still lead their league despite dropping five points in their last two games so they will be keen to take the three points from their home game against IES 3rds (3.30) while the Men’s 4ths travel to play IES 4ths (1.00) looking to boost their promotion hopes in a very open league. Meanwhile the Men’s 5ths entertain Magpies 6ths (12.15) and when the teams met early in the season it was a very exciting affair. Archie Derbyshire opened the scoring for the 6ths with Arthur Johnson and Ben Emms replying for the 5ths. Richard Allcock then equalised for the 6ths before Andy Caston twice scored for the 5ths both side of a response by Fabien Mitchell to clinch a 4-3 win for his team. Let’s hope for similar fare on Saturday! The Ladies’ 7ths get their post-Christmas/New Year programme underway when they play Norwich City 7ths away with a late start of 4.45. The fortunes of our team in the second half of the season (especially the Men’s teams) will depend on the availability of players. It is hoped that those with school commitments will make themselves available whenever possible. The Boys’ Development are without a game this Saturday but as last weekend (when Dereham called off) a training game is planned for 10.45 at Weybread. Good luck as always to all our teams this weekend. Please see the Latest News page of the website for the full list of fixtures. We can promote your editorials every week on the Iceni Post!